Athletics have become a very important part in children’s lives nowadays. All parents understand the importance and relevance of any kind of sport in their children’s lives. As a result, many children have a particular sport that he or she is dedicated to, be it cricket, football, baseball, basketball or even athletics like gymnastics or swimming. These sports function as important aids to their physical and mental growth. However, some sports, like Kids Mixed Martial Arts (Kids MMA) can be quite dangerous if not properly prepared for. It is therefore of utmost importance that children have the right kind of equipment while engaging in sports of this sort. Different Types of MMA Gear Used by Kids Today MMA is a mixture of different types of martial arts including Tae Kwon Do and Jiu Jitsu as well as other forms of combat sports like boxing and wrestling. A lot of parents are uneasy about their children being involved in this type of competitive fighting. Parents should understand that the risk of injury is greatly decreased when the proper safety equipment and gear is utilized. The style of kids MMA gear is becoming increasingly popular as it is being adapted as a fashion statement by both fighters as well as admirers of the sport. MMA artists have to wear certain items of clothing as defining agents for the sport they represent. Typically, any kind of professional MMA attire will have a lot of sponsorships, endorsements and advertising patches. It will also be bold and colorful so that it can make a statement and display attitude and verve. Various kinds of MMA attire, like hoodies, jackets, t-shirts, and most importantly, shorts have started crowding sporting goods stores. They are very popular and retailers know they can clear stocks in mere days. Usually, clothes for kids in MMA are made from dry and easy UV safe material that is durable and enables flexibility while moving or fighting. The stitching on MMA gear has to be especially durable and the clothes must fit like a second skin. The comfort factor is also very important because the sheer exhaustion of constantly fighting can take a toll on someone’s energy. For this reason comfort is an essential aspect. MMA gear also includes jackets and hoodies which ensure that the wearer, especially the kids who are involved in MMA, remain warm and do not catch a chill from perspiring in the open air continuously. Kids MMA Gear Must Provide Basic Protection Plenty of protective kids MMA gear is available in stores which ensure that the sport is safe enough to indulge in. One of the most crucial pieces of protective gear for kids MMA is headgear. The headgear will protect your child’s head from injures than can be brought about by falls or punches which are common to the sport. Other important protective MMA gear would include gloves. They protect fingers and wrists from getting broken or hurt during contact. Mouthpieces also play a vital role as they protect your child’s gum and teeth from stray punches. Shin guards, foot guards and even ankle wraps are some final items needed to safely participate in this popular sport and ensure your child’s safety. MMA offers the value of perseverance, self-control, respect, as well as anger management aside from having physical benefits. However, not protecting your child as they explore and learn MMA can cause adverse results both mentally and physically so be sure to invest in the proper gear before they get started! Picture: Young Revgear fighter Aalijah Pineda. 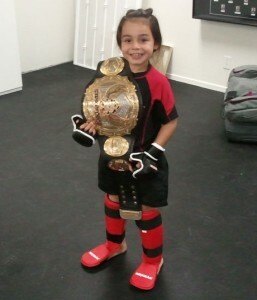 Aalijah is holding the Strikeforce Title belt belonging to Cris "Cyborg" Santos.